In the early 1500s, Russia wasn’t particularly known as a great nation. Barely hobbling along due to the fact that up until 1480, they had been under Mongolian rule, Russia had not been doing as well as the other European nations. Ivan the III was able to declare himself the Tsar of Russia and separate them from the Mongolian state once and for all. Known as Ivan the Great, his work to increase the size of Russia, fight against the Golden Hordes and unify most of Russian land under one banner would essentially lay the foundations of Russia as a state. Ivan the III’s death left his son, Ivan IV on the throne, although little Ivan was just three years old at the time. Ivan the IV would come be known as Ivan the Terrible and his reign began on January 16th, 1547. When he had been just a child, Ivan’s mother had been assassinated by plotting boyars. A boyar is the highest rank that could be achieved in the Russian aristocracy. With Ivan’s mother and father dead, the boyars were free to try and take control of the throne, by acting as regents for the would-be king. It is most likely that these aristocrats were abusive towards Ivan and his brother, leaving deep emotional scars in the boy. Despite their best efforts, Ivan was able to ascend to the throne when he was sixteen and proclaimed himself to be the Tsar of All the Russians. He was crowned and claimed that he would be in charge of everything. In many ways, Ivan the IV would become Russia’s first real autocrat, showing that his authority was not to be questioned and was above the concerns of the peasantry. Yet, in spite of Ivan’s nickname, he was actually a very competent ruler. His early reign led to a lot of reformation within Russia, including the introduction of the very first printing press in Russia. He ordered the creation of the Moscow Print Yard, which would go on to allow books to be created and circulate within Russia. Other accomplishments Ivan managed to pull off during his early leadership was the establishment of the first Russian parliament, construction of St. Basil’s Cathedral in Moscow and restricted peasant’s ability to move throughout the country. He was an effective ruler and managed to get a lot of progressive work done. However, while Ivan’s focus on improving the government was leading to positive changes within the nation, there were a string of events that began to lead to his descent into instability. As famine, drought and war plagued the Russian state, his first wife, Anastasia Romanov died and he suspected that she was poisoned. This would deeply impact his mind and lead to a growing level of paranoia. To make matters worse, one of his advisors fled from his courts and defected to Lithuania, betraying Ivan and leading Lithuanian troops against his own territory. In 1564, Ivan’s temper and paranoia was growing more intense. He was known for having emotional outbursts, but since the death of his wife, he was growing even worse. He departed from Moscow and sent letters to the nobility of Russia, informing them that he was abandoning the throne. The boyars didn’t have the ability to control Russia and with the pressure of foreign enemies all around them, they were forced to send envoys to Ivan begging him to return. Ivan had two conditions for his return: the first was that he would be granted absolute power as Tsar and the second was that he would be allowed to execute those whom he deemed to be traitors without any approval. Both demands were agreed to and Ivan returned to Moscow a new and more deranged man. His first act upon returning to rule was to establish the Oprichnina. The Oprichnina was a territory that was excusive in control of Ivan and was essentially a state that would serve as the homeland to his personal guards. These guards were known as Oprichniki and would become key enforcers during Ivan’s reign. They only served Ivan and would be responsible for the capture and elimination of many princes whom Ivan had charged with treason. One paranoid episode led to Ivan coming under the delusion that the city of Novgorod would defect to Lithuanian rule. In response to these fears, Ivan ordered the Oprichniki to invade the city. They were quick to burn and pillage the city, killing thousands in the process. This more or less crippled Novgorod for good and left it unable to restore to its former glory. Ivan’s mental health did deteriorate over the years, causing him to accuse a great many nobleman of being a traitor and seeing to their death or exile. He wasn’t a man who was willing to risk being usurped. A great deal of this attitude could easily be traced back to his childhood, when he was essentially isolated as a child. After his mother had died, the boyars completely ignored him, leaving the eight-year-old boy to fend for himself. He received no attention, no affection and certainly no love. The only time the boyars had ever paid attention to him was when he was needed for an official ceremony of some kind. When you throw on the suspicious manner in which his wife was killed, it makes sense that he was genuinely afraid of the nobility attempting to usurp him. Ivan was prone to outbursts of rage and fits of anger. This would make him a strong leader in the eyes of the people, for he was seen not to tolerate any kind of nonsense, but sometimes the wrath would escape from him. In one instance, he ended up getting into an argument with his son, leading Ivan to lose his temper and strike him with a staff. The wound ended up being fatal, which had not been Ivan’s intention. With the death of his son, the throne would be passed on to Feodor, a smart but incompetent leader. Perhaps one of the more interesting things about Ivan was his nickname. When we in our modern era hear the name Ivan the Terrible, it conjures the idea of a man being evil, obsessive and cruel. The word terrible holds a lot of connotations to it, but all of them bad. We would never refer to a good leader as terrible. Yet, while that might have been Ivan’s name, and he was prone to outbursts, his nickname did not stem from the violent and cruel deeds that he did to nobles, but rather it stemmed from his greatness. The word terrible used in this context comes from the word Grozny. Grozny means able to inspire fear and terror. Dangerous and formidable. It loosely translates to awe-full, meaning someone who demands awe. All of these words back in the 1500s would not denote an evil leader, but rather would be considered to be a title of honor. In a world where there were many enemies of the Russian state, both inside and outside, the name of Terrible would indicate that you were not someone to be messed with. It would show that your fierceness and power would cause your enemies to rue the day they crossed you. In other words, the title was more or less an honor. In our modern context, however, we equivocate terrible with evil. So, we would consider this to be a title that was dishonorable. Ivan’s reign wasn’t nearly as bad as many other Russian rulers. His actions, while leading to a lot of persecution of the nobility, were primarily focused on improving Russia as a state. He was skilled with diplomacy, was highly devout towards the Orthodox Church and was very good at compounding Russian power. His violent and brutal attitude towards the boyars and aristocrats ended up gutting most of the controls that they had over the government, placing Russian control purely into the hands of the Tsar. 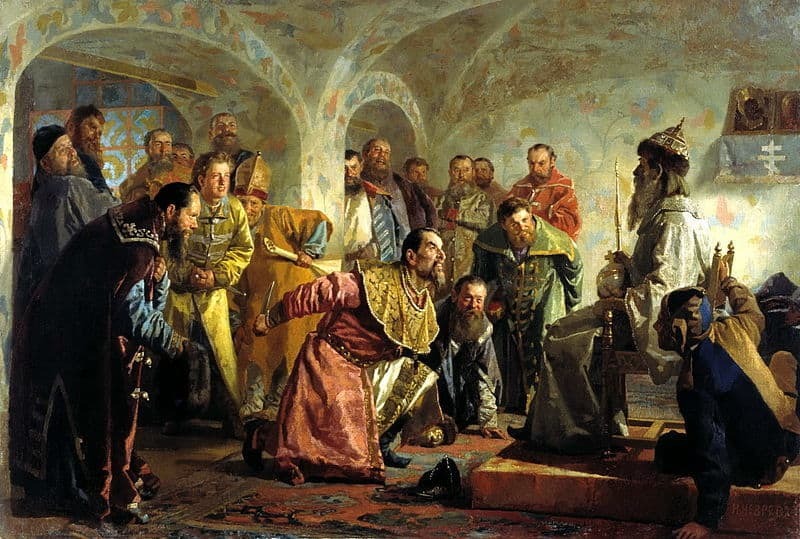 Ivan the Terrible more or less created the Russian empire, but while he had been skilled at compounding rule and forcing the nobles to lose more and more power, he had made some key mistakes during his reign. The biggest series of mistakes that he had made was with his warfare. While he managed a few successful campaigns, invading and seizing control of Siberia, Kazan and Crimea, his use of manpower had sufficiently drained Russia of a lot of resources. The taxes that he levied against his people were too great for them to afford and it had terrible effects on the local economy. While Ivan had successfully created a massive Russian empire, that empire barely had a dollar to its name due to the economic crisis. Yet, in spite of his temper, the taxation and the endless series of wars that he waged, Ivan created a bureaucracy that had never before been seen in Russia. His focus on creating a government that was autocratic across a massive span of territory would mean that there needed to be some kind of administration system. This led Ivan to appoint local governments throughout his territory, empowering them to handle things like implementing laws or ordinance changes. The greatest contribution to the establishment of a stronger governmental reach was the creation of what was known as the zemsky sobor. The zemsky sobor was essentially the first Russian parliament, designed to make decisions, discuss serious issues within the country and administer the laws and rules that Ivan created. They were represented by the nobility, the church and representatives of town. This institution would provide a great deal of stability to the Russian region until the Romanov family would come into power. Ivan the Terrible was a paradox of a man. Known for his violence and rage, but responsible for the glorious rise of the Russian empire, he is considered to be a man of legend and worthy of respect. As for the name Terrible, there have been far worse rulers than him to come along. While many might believe that he was an evil man, very little in history indicates that he was. Rather, we see that he was complicated in just about every facet of his life. He deeply devout man who suffered from paranoia, rage and fear of losing the throne due to scheming plotters. Historians would later theorize as to why he was so paranoid. The most accessible theory was that his childhood abuse at the hands of the boyars left him with a great hatred of them and he would take any excuse he could to eliminate them. Other theories were that he suffered from syphilis in his final years, a disease that was known for causing mental instability. Regardless of the reason why, we know that his actions did not stem out of purely evil desires, but out of fear. Ivan the Terrible’s reign lasted for 37 years before he died. His death was a peaceful one, he did not die at the hands of conspirators or murderers, but rather had a stroke on March 28th, 1584. His reign, while effective at garnering power, would end up causing a rough period for the Russian people known as the Time of Troubles. His son, Feodor, wasn’t a very good ruler and ended up dying without any children. Without having a clear heir to the throne, this would go on to throw Russia into a series of usurpations, wars and conflicts in order to claim the throne. As with any historical figure, there is a lot of myth and mystery surrounding Ivan. His reign was recorded from a very small pool of sources and there have been many folk tales, legends and myths spread about him to reinforce the idea that he was a brutal and bloody tyrant. The truth is that Ivan was nothing more than a savvy administrator who understood what it would take in order to protect himself from the world of intrigue involving the nobility. He was not a madman, but would do anything to preserve his rule.